This is one of my favourite areas in Lakeland. The Great Langdale valley is delectable country and the Crinkle Crags ridge leading up to the pinnacle of Bowfell occupies prime position at its head. It had been a few years since I last did this route and at the time I rushed it due it impending bad weather and didn't really have time to savour the views. Today, however, the forecast was perfect and I had the company of my Dad, so no need to race. 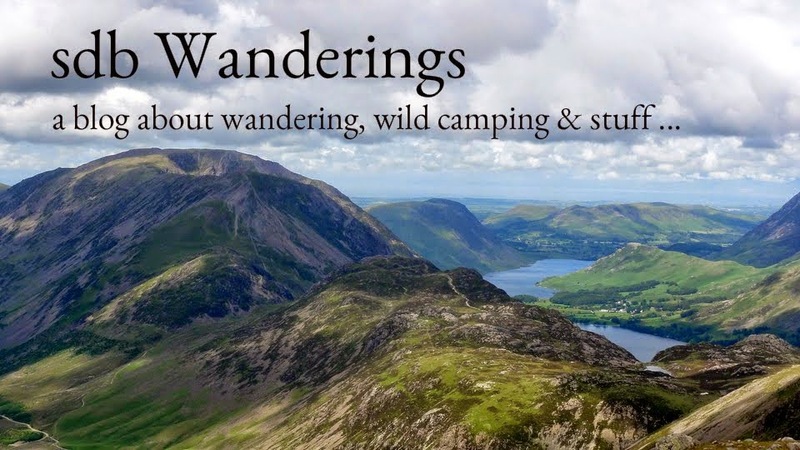 This particular route from Stool End Farm up the Oxendale path and along Crinkle Crags to Bowfell has become increasingly popular since being featured in the Julia Bradbury 'Wainwright Walks' TV series. Our intended route, as did Julia's, also included the 'climbers traverse' path along the eastern face of Bowfell, which skirts its most impressive rock scenery. At least that was the plan. The route can be demanding for some and although my Dad managed to climb Ben Nevis, Snowdon & Scafell Pike in his 70th year last summer, he hadn't done any fell walking since. We therefore had options to bale out down the 'Band' after Crinkle Crags or to climb Bowfell via the less exposed tourist route directly from 3 Tarns. We set off in bright sunshine at 11am along the path to Stool End Farm and then headed up the Oxendale Valley. From the new wooden bridge (rebuilt in 2005 after a storm swept the old one away) the path heads steeply up towards Red Tarn. Height is gained rapidly in this first section and backward glances reveal a constantly changing perspective of the Langdale Pikes. The path gains a distinctively red tinge as Red Tarn is approached due the abundance of haematite & red sandstone in this area. Once at Red Tarn the bulk of the days steep ascent is done and the route flattens off as it approaches the first Crinkle. A short diversion up to Great Knott is well worth the effort as from this vantage point the whole ridge can be seen in all its glory. From here the path is currently being improved by the 'fix the fells' team who today were busily grafting in the hot sun. Finally a short but steep section leads up to the summit of Crinkle 1. Here, for the first time, the Scafells come into view over the Eskdale valley. We had lunch here just off to the western side enjoying superb views right down the length of the Great Langdale valley. Wainwright describes the walk along Crinkle Crags as "the finest ridge mile in the Lake District" and a "fell walkers delight". It's easy to see why with steep drops down to plunging valleys on both sides and a constantly changing terrain underfoot. The approach to Crinkle 2 (Long Top) reveals the famous 'Bad Step' which seemingly blocks the direct route up to the summit. It is essentially a large chockstone wedged at the top of a narrow 12 foot high gulley. The solution is a 'fairly' simple climb up the rock face on the right side, after which the summit is a 1 minute 'boulder stroll' away. My Dad didn't fancy this so he took the alternative path around to the left while I cautiously scrambled up. The summit of the second Crinkle represents the true summit of Crinkle Crags but I think the best views are from Crinkle 3 which imposes more abruptly than the others into Great Langdale giving the best perspective along the valley. As the ridge walk continues its undulating course, Bowfell becomes more imposing with every step. A short detour to Shelter Crags (essentially the 6th Crinkle) shows it off best. From 3 Tarns we had a rest stop & stamina check resulting in the decision to carry on up Bowfell via the climbers traverse route. This involves skirting 'off path' eastwards across the southern flank of Bowfell until the narrow winding path is picked up. Climbers traverse is essentially a rock climbers route to access the vertical crags of Bowfell Buttress, Flat Crags & Cambridge Crags. These towering rock faces represent Bowfells best bits and are largely hidden from view to walkers climbing up from the 'Band' and the typical route from 3 Tarns. The traverse clings to Bowfell's steep eastern flank passing right under these vertical walls of rock until a point is reached at the bottom centre of Cambridge Crag where a spring emerges from the rock face. It is here that Wainwright recommends stopping for a drink as "nothing better ever came out of a barrel or a bottle". It really is very invigorating and provides just the refreshment needed before tackling the steep route upwards from here. From this point a steep diagonal route is evident cutting backwards (leftwards as you look at Cambridge Crag) up a 'river of boulders'. This is the way up, which once followed, quite quickly reveals the lower part of Great Slab, an aptly named huge hunk of flat rock dominating the left side of the ascent. Route choice is now to either continue the scramble up the boulder field or walk up the calf burning angular rock face of Great Slab. Having tried both, I prefer the former as the use of hands can be quite reassuring on such an exposed area. The top of Great Slab is one of the best places to be in the fells. 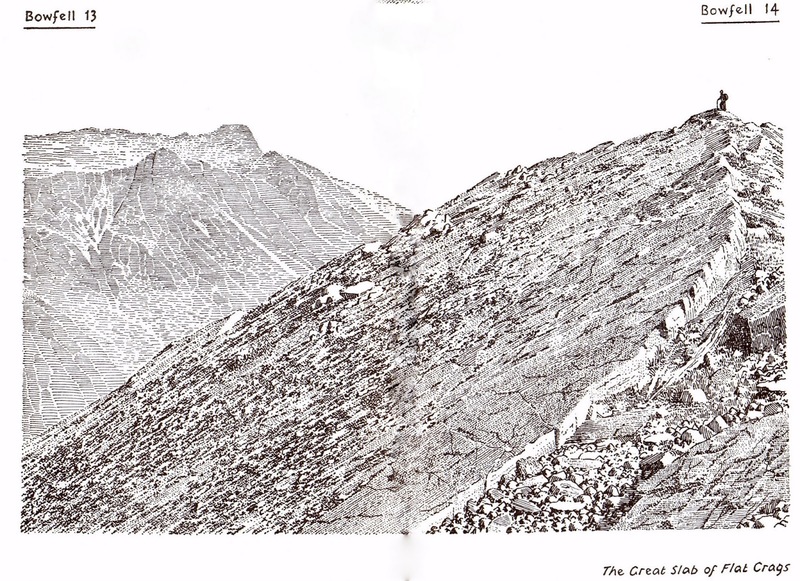 This classic view with the Langdale Pikes in the background is immortalised in Wainwright's ink drawing in book 4. Walking with a companion today meant I could take advantage of them as photographer while I made my way over to pose similarly at the top. From here it is a 2 minute wander over the boulder strewn summit until the top is reached. The summit panorama is outstanding as Bowfell occupies prime position at the head of 3 main valleys (Great Langdale, Eskdale & Langstrath). In fact only Great Gable, out of all the high Lakeland fells, is not fully visible. We were lucky to be up there in good weather today as usually, if there is a cloud to be seen in Cumbria, it is often perched stubbornly on Bowfell summit. For the record, its only a 30 minute climb from the water spout to the summit, but Oh! what a great 30 minutes! The Scafells from Bowfell summit : Broad Stand looking very vertical from here! We then headed down towards 3 Tarns and back along the Band. Exactly 2 hours later we were enjoying a well earned pint at the Old Dungeon Ghyll as the last light of day slid over the Langdale Pikes ending a fantastic day in the fells. Yeh its a great route Anthony. Even better if contunue on to Esk Pike and back down via Rossett Pike as get a great perspective of Bowfells crags from that that way down.